Backpacks are very useful for all people, regardless their age, hobbies or occupation. Apart from making carrying stuff a lot easier, they can be cool, trendy items that are popular with people who want to stay fashionable. Since the trend is ever changing and there are so many different models available, we reviewed some of the most appreciated articles available for sale to offer you an accurate description. This should make your decision more manageable, and the results obtained more satisfying. Sometimes, going back to a classic design can be a way to remain trendy. This product features a simple, basic and classic design which looks cool and is also as functional as possible. Suitable for carrying books, notebooks, and laptops, the model is meant for students, both for their time at school and for other activities. Featuring a roomy interior with a generous front pocket, it has a flexible storage space. The backside pocket offers more space, while the frontal one is suitable for small items such as keys, cell phones, and others. 2 Velcro side pockets and a durable zipper are extra features you will surely like. A popular choice is this daypack which has excellent value for the money, being functional, durable and boasting a fresh, modern design. The comfortable, straight-cut padded shoulder straps, together with a padded back panel allow you to carry greater weights and more items than before comfortably. Having a 600-denier construction, it is resistant to daily wear and tear. It has a capacity of 1,550 cubic inches, measuring 13 by 16.7 by 8.5 inches in size. The interior is designed to allow the user to store items like textbooks, notebooks, laptops and other useful objects. The small front pocket has an organizer for little things. Suitable for people who need increased carrying capacity but who do not want to compromise on comfort and value, this backpack is one of the top-sellers in this category. It features one large main compartment and a frontal pocket with a built-in organizer for secure storage of USB sticks, small notebooks or cellphones. Made to be long-lasting and lighter than roller backpacks, it is appreciated by customers for its quality and proper construction. It is versatile, including dual side mesh pockets and a frontal mesh pocket for additional carrying capacity. The model is available in many different colors too, so you will surely find one to your liking. Designed for the modern employee, this product is perfect not only for office use but also for going to the gym or school. It features a cool bottom shoe pocket, separated from the main body, so you can carry the more formal shoes easily when going to work. Made from Polyester, it is machine-washable, unlike some great leather backpacks. A large main compartment allows you to carry a laptop, books, notebooks or other items used throughout the day. Mesh side pockets are included too, increasing its versatility. Comfortable straps are featured, as well as reflective tape for improved safety on poorly lit roads. The college backpack produced by Tomtoc is everything that a student needs to carry his books or laptop around. Featuring large, multi-purpose pockets and a solid build with comfortable straps, it has excellent value for the money and is an item worth taking into consideration. Ample interior pockets are fitted with organizers perfect for USB sticks, cards or other digital gadgets. It has side pockets for water bottles too, and with the padded cotton straps, you will not feel the strain or fatigue of carrying this much weight on your back. Furthermore, the item is splash-proof and wear resistant, thanks to the durable premium polyester used for making it. Backpacks have always been an accessory worn by children in school or by hikers. But in the past years, it has gained tremendous popularity thanks to their practicality and ability to be versatile. Everyone is starting to gain interest in backpacks because they look great with almost any piece of clothing and the variety of models have clearly made a fashion statement. Even if you don’t plan on going to school or college, you most likely feel an urge to follow the trend and purchase a great item that you can wear all day long. If you want to own this kind of adornment, but you feel unsure where to start your research from, let someone who knows a thing or two give you some hints. Read these lines and see if you don’t become a backpack addict at the end. Serious backpack fans, we’ve done our homework and come up with a useful buying guide that has all the important features to look for when shopping for the coolest backpacks for sale. Maybe you’ll feel more relaxed once you get to the bottom of the wonderful backpack world. Backpacks look cool no matter your outfit and give you plenty of space to carry everything you need on a regular day. Women and men alike can wear these items because there are so many stylish options right now that it is impossible not to find something you like. Just pay attention to these features and your next shopping session for an awesome backpack will be filled with tons of fun. Depending on your personal needs and preferences, you should opt for a comfortable backpack size. Just like a bag or purse, you will need many compartments to put all your possessions. Therefore, pick a size that allows you to have every necessary item with you, from wallet to gum. If you suffer from medical conditions that forbid you to carry too much weight, then choose something with padded straps and a medium size. Backpacks distribute their load evenly, on both shoulders, compared to normal hand or shoulder bags. Despite this, there’s no need to purchase a large backpack if you don’t have the tendency to take half the house with you. 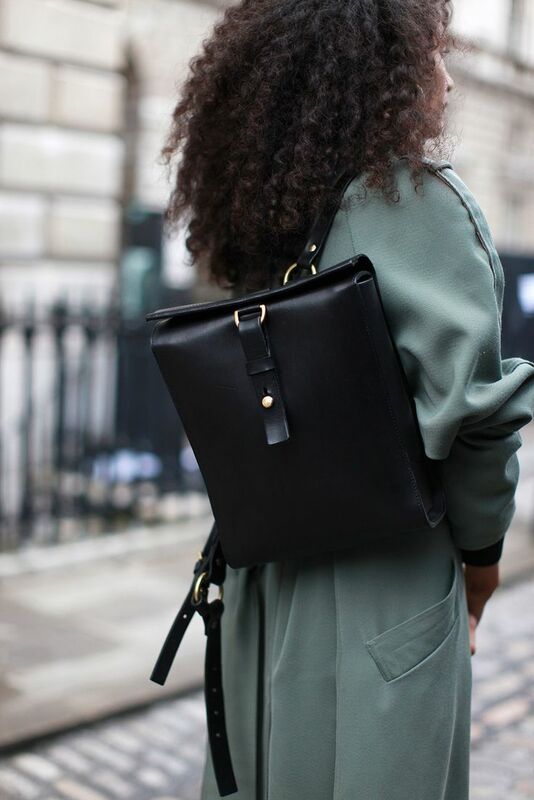 Stick to city backpacks from leather or fabric combinations that look chic and elegant. For those that like a little hiking session at the end of the weekend, there are specialized stores where mountain gear is sold. These backpacks come in different sizes and weights, depending on your volume of water and supplies you need to carry with you while traveling. Black backpacks are ideal because they are neutral and have the ability to complete any outfit. Plus, they don’t get dirty that fast and stains are not that visible. The most important aspect when it comes to cool black backpacks is the personal style in matters of fashion and trends. Not everyone wants something that has a label but lacks functionality while others want to wear only products that follow the actual trends. If you need a backpack for work, then you might consider a sports one because they have many pockets and comfortable straps. You can put your laptop or tablet inside and other useful things such as pens, office papers, and even lunch. Backpacks look great if you’re dressed in something more casual and give a nice appearance to a dress or skirt. Especially those that come in black shades go with everything you own in the closet and don’t need special shoes. Wear them while going to the groceries or doing all sorts of chores. If you only use the backpack as a wallet storage, you’ll need something with a few pockets and not so many zippers. A hidden compartment for your phone could come in handy and maybe a small interior pocket to put your house and car keys. Backpacks are a fantastic option if you want to go shopping and pack everything so that you don’t come home with dozens of handbags. Most people want backpacks that are outfitted with quick access pockets. When you’re in a hurry and need something, it’s a hassle to start digging through deep pockets to find what you’re looking for. On the contrary, pockets that are too small cause another issue because you can’t safely deposit something inside. Good backpacks provide these quick access pockets hidden and use only one zipper for full access. Moreover, pockets placed on both side of the backpack are quite useful because it’s easier to reach for them and the bulkiness they add to the bag tends to go towards the bottom. Try to avoid as much as possible large front pockets because they tend to give a disproportionate overall look to your backpack and are a tad difficult to carry. Another thing you should consider is the padding. Especially if you need a backpack for going hiking or hitting the gym, you need a great deal of comfort and stability. The more weight you add to a backpack the more padding you’ll need. You don’t need tons of padding. If you can fill up the bag and you don’t see any difference to its when leaning on your back, then the padding is more than enough. Too much of it causes ventilation issues and stops your skin from breathing properly. Smartphones owners know how important is to have your battery charged whoever you go. Because we use the Internet so much, we need a permanent source of charging. External batteries are a blast, but they need a place to be put in order to securely charge our phone. Some of the best black leather backpacks that come with a USB battery mini space. That way you don’t need to take all of your items out of the bag to plug your phone or tablet. If you like to listen to music see if the backpack you’ve set your eyes on has a small hole on top that allows you to stick your headphones cable. It’s a practical feature if you don’t use Bluetooth headsets. Before buying a backpack think of the reason, you need such a piece of accessory. Do you need it for holidays and city breaks or for regular daily use? Depending on the answer, you should consider the size, weight, and fabric. A large one made from a waterproof material is a great option for outdoor activities while a leather black one is more suitable for going out or shopping sessions. Make smart choices and take your time to find the backpack of your dreams.